BBC Northern Ireland (Irish: BBC Thuaisceart Éireann; Ulster-Scots: BBC Norlin Airlan) is a division of the BBC and the main public broadcaster in Northern Ireland. It is one of the three BBC national regions, together with BBC Scotland and BBC Cymru Wales. Based at Broadcasting House, Belfast, it provides television, radio, online and interactive television content. BBC Northern Ireland currently employs 700 people, largely in Belfast. BBC Northern Ireland has two TV channels - BBC One Northern Ireland, BBC Two Northern Ireland; and two radio stations - BBC Radio Ulster and BBC Radio Foyle. Broadcasting House, Belfast, Headquarters of the BBC in Northern Ireland. Prior to 27 October 2006, BBC Two NI was a digital only service while BBC Two Northern Ireland was available on analogue transmission. Since 28 October 2006, BBC Two Northern Ireland has been the on-air name for both services which have been merged. BBC Northern Ireland has its own team of continuity announcers which introduce the vast majority of programmes on BBC One and BBC Two in Northern Ireland. BBC Northern Ireland makes some of its own programmes itself. However, unlike the radio stations, the television stations' content is for the most part identical to that broadcast by the BBC One and BBC Two channels in England. Some network programmes may however be time-shifted to make room for more local programming. Most local programmes are broadcast on BBC One Northern Ireland. BBC Newsline is the regional news service. Its main presenters are Donna Traynor and Tara Mills. The main bulletin is from 18.30–19.00 with shorter bulletins at 13.30 and 22.30. Summaries are also broadcast during Breakfast and the early afternoon. specialist coverage of events such a visit by Queen Elizabeth II, or a cross border visit by a dignitary such as the President of Ireland, or a distinguished overseas visitor such as the US President. There is coverage of the Orange parades on 12 July, St. Patrick's Day parades on 17 March, etc. As well as programmes intended purely for a regional audience, BBC Northern Ireland also produces programmes for national consumption on the BBC's channels across the UK. The main part of BBC Northern Ireland's network productions are in comedy and drama. This has included producing the high-profile drama series Messiah. BBC Northern Ireland is also involved in co-productions with other broadcasting networks, most notably with the Irish broadcaster RTÉ. BBC One Northern Ireland and BBC Two Northern Ireland are widely available across the border in the Republic of Ireland. These channels are carried on pay-TV platforms in the Republic including Sky Ireland, Virgin Media Ireland, Magnet Networks, SCTV and Crossan Cable. BBC One NI and BBC Two NI are also available in the Republic via signal overspill by Freeview in counties near the Northern Ireland border. Similarly, prior to the digital switchover in 2012, they were available in these areas via analogue television. Additional BBC channels such as BBC Four, BBC News, and BBC World News, are also available within the Republic of Ireland via a free-to-air satellite receiver or, in some areas near the border, via overspill from the Freeview service. Leading subscription TV providers also carry these channels. On 1 February 2010 the Republic of Ireland's Minister for Communications Eamon Ryan signed an agreement with the UK's Ben Bradshaw. This agreement has enabled viewers within Northern Ireland to watch RTÉ One, RTÉ Two and TG4 on Freeview after the digital switchover took place in 2012. BBC Northern Ireland takes part in the 'Regionalisation' of some of the BBC's national radio output. Until 2012, for example, Radio 1 split the home nations on Thursday morning from midnight to 2–am, with Scotland, Wales and Northern Ireland broadcasting their own shows to showcase regional talent. The Radio 1 session from Northern Ireland was last presented by Phil Taggart from Omagh. BBC Northern Ireland's online service provides News, Sport, Schools, Learning and Programme information for television and radio programmes. It provides a streaming audio service for Radio Ulster and Radio Foyle as well as every programme on demand for up to a week after transmission. bbc.co.uk/northernireland/ is part of BBC Online and operated from the Belfast base. It also provides multi platform interactivity for TV programmes including the annual Schools' Cup Rugby union and Gaelic Athletic Association finals. In recent years BBC Northern Ireland in conjunction with Libraries NI, have launched an interactive road show visiting libraries across Northern Ireland. The road show allows people to learn more about day-to-day life in the BBC as well as allowing them to take part in activities such as presenting the news or weather, starring in a radio drama or making jingles. For the majority of the days, there is an outside broadcast from BBC Radio Ulster's Hugo Duncan. In 2010 BBC Northern Ireland with RTÉ Sport, TG4 and BBC Alba bought the rights for Celtic League rugby. Setanta Sports had held the Irish and Scottish rights from 2004 to 2009. BBC NI provide coverage of Irish League football. Although BBC Northern Ireland broadcasts primarily in English, there is some programming in Irish Gaelic and Ulster Scots. Radio Ulster carries a daily programme in Irish and there is an Irish language section on BBC Northern Ireland's website, where reference is made to "BBC Thuaisceart Éireann". There are also occasionally TV programmes in Irish. Programmes are also broadcast in Ulster Scots, though with much less frequency. There is a weekly radio programme for the Chinese community in Northern Ireland which broadcasts in Cantonese, called "Wah Yan Jee Sing". The BBC television and radio stations are broadcast primarily from the Divis (500 kW), Limavady and Brougher Mountain transmitters. Both transmitters receive the BBC stations via a satellite feeds and each transmitter has a wealth of relay transmitters to provide analogue service to areas not served by their respective main transmitter. BBC Northern Ireland have a radio link from their studios in Belfast which allows mobile on-location news crews to hear the studio; the test tone is known as the "commbeep". BBC Northern Ireland has three main television studios located in Belfast. 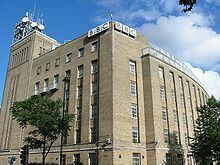 There are two small studios located in the BBC Broadcasting House in Belfast. These are home to BBC Northern Ireland's regional news and current affairs programmes. They are around 2,000 sq ft (190 m2) each and are called Studio B and Studio 1. The largest of the studios is called Studio A which is located in the BBC Blackstaff House on Great Victoria Street in Belfast. The studio measures 6,000 sq ft (560 m2). Studio A has been home to the award winning local sitcom Give My Head Peace. Gerry Anderson – former presenter of The Gerry Anderson Show on BBC Radio Ulster, a unique voice in broadcasting without a script. ^ "Saorview Combi Channels". Archived from the original on 27 June 2013. Retrieved 4 June 2013. ^ "Saorview/ Freeview Overspill Advice". Archived from the original on 15 October 2012. Retrieved 4 June 2013. ^ "RTÉ and TG4 to be freely available in North in 2012 – The Irish Times – Tue, 2 Feb 2010". 2 February 2010. Retrieved 7 February 2010. ^ "RTÉ News: Ryan signs TG4 agreement with the British government". 1 February 2010. Archived from the original on 11 February 2010. Retrieved 7 February 2010. ^ Clutton, Graham (9 June 2010). "Celtic Rugby secure improved broadcast deal for Magners League coverage". London: telegraph.co.uk. Retrieved 9 June 2010.